This post was inspired by a few different conversations I’ve had recently about my favourite science fiction books. I hope you find at least one new recommendation in this list! 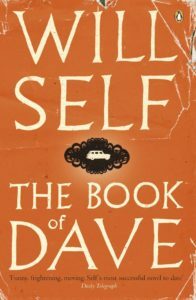 The Book of Dave by Will Self. A grim, futuristic society set in the land formerly known as England. This society’s religious beliefs and social structure are based on a long rant written by a frustrated cab driver hundreds of years before the events of this story began. There is a lot more going on in the plot than what I shared above. I won’t share spoilers about the rest of the storyline, but I still think about these characters even though it’s been years since I read this book. Their experiences cross the boundaries between religion and science as well as between what is currently possible in 2017 and what could become possible in a few short decades. This is the kind of fictional world that bleeds into our own. I can’t count the number of times I’ve heard someone say something in our reality that sounds like it came straight from the Book of Dave. It surprises me a little bit every time it happens. Imagine a world where cancer and the common cold no longer exist. What’s the catch? The cures for these diseases unleashed a virus that turns people into zombies. The main character grew up in this world. She can’t remember what life was like before people risked their lives every time they left the safety of a compound. The characters understand the campiness of certain situations, and they’re not above playing up those moments at times. I enjoyed those brief moments of humor in what was an otherwise serious tale. 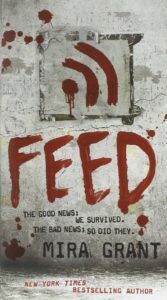 I also liked the fact that human society adjusted so quickly to the reality of living alongside zombies. Most of the characters make logical choices. There weren’t any instances of people suddenly forgetting to follow basic safety rules or doing other things that don’t fit what the reader knowns about them as an individual. 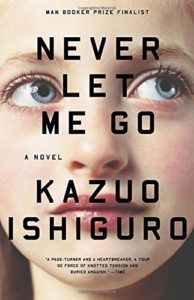 A group of children growing up in a remote boarding school, none of whom have ever known their biological parents. Their strict, isolated upbringing only grows more bizarre over time. When they grow up and start to fill the roles they were meant to fill, the mysteries of their odd childhoods finally begin to make sense. To be honest with you, I didn’t know what I thought of this book the first time I read it. My interpretation of what was going on with the characters was completely different back then as compared to what it is now. I can’t say much else about this without give away the ending, but Kazuo gave me a lot of food for thought. It was especially interesting to look back at how everything started once I knew how it ended. There were plenty of clues about what was going on from the beginning if you paid attention to what the narrator was and wasn’t saying along the way. 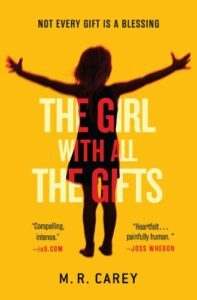 A child named Melanie who lives on a military base with a small group of other children. All of the soldiers who guard the building where the kids live are inexplicably terrified of them. Melanie’s teacher, Miss Justineau, isn’t scared, though. For now she seems to be perfectly content teaching the strange, little children who only eat once a week and never seem to grow. Those of you who have been known me for a while might remember how much I loved this story. It’s hard to talk about the rest of the plot without giving away spoilers, but I was fascinated by the idea of a 10-year-old girl being perceived to be such a huge threat by the soldiers who guarded her. The plot twists were simply well done. I’d be lying if I said I didn’t figure some of them out before the characters realized what was going on, but it was still exciting to see how they unfolded. This was especially true when it came to the ending. I couldn’t have imagined a more fitting one for Melanie and her friends. As much as I’d like to see a sequel, I felt genuinely satisfied by how the author wrapped everything up. An astronaut named Mark who accidentally gets left behind on Mars after an accident. His fellow astronauts believed him to be dead when they left. Now he has to survive alone on a hostile world for years until a rescue mission can save him. Simply put, the storytelling was phenomenal. 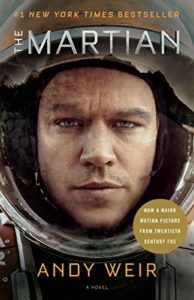 It was so good, in fact, that I’d recommend watching the movie just as heartily as I would recommend reading The Martian. You don’t have to experience both of them if you don’t want to. They both were the exact same story. Both versions of this story are full of tension. Mark is injured when he wakes up on Mars after the accident. He quickly has to figure out not only how to treat his injury but also how to repair the damaged equipment that he will rely on to survive. These are the first two of many problems he has to solve on his own. From what I’ve read, the scientific portions of Mark’s adventure were pretty accurate. Knowing that these were fairly close to the kinds of dilemmas that real astronauts would deal with in this situation made me even more invested in finding out if Mark would ever figure out a way to get back to Earth.